WHERE: Wasdale, English Lake District. WHAT: mountain of character & personality. MAP: Yewbarrow. Thumbnail click pops-up larger image. LakeDistrictDesktops.com webmaster Andy Bannister has the good fortune to be spending a week in the Lake District, which means in turn visitors to the web site have the good fortune to receive double the usual number of updates. 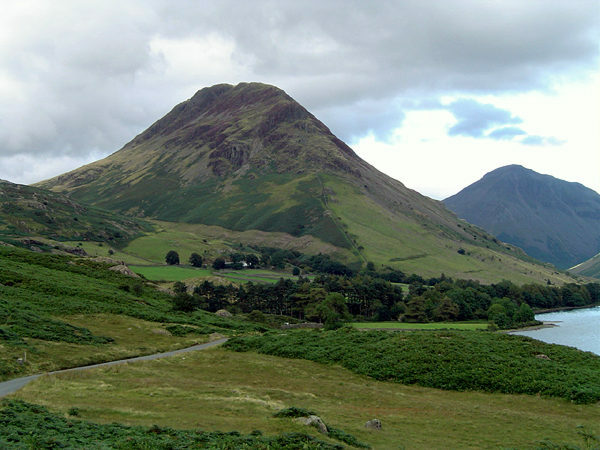 We chose this shapely mountain, Yewbarrow, which rises up from the Wasdale valley, with the lake of Wastwater just visible on the right of the picture. If you are one of those people prone to investing human characteristics in inanimate objects, we suggest a fine Irish tenor on a soaring arpeggio. Begorra!